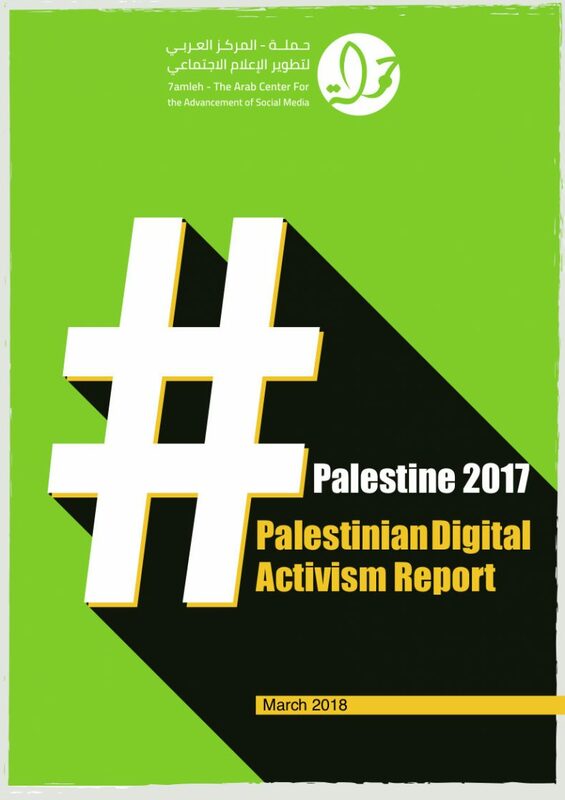 7amleh – The Arab Center for the Advancement of Social Media publishes today its annual report on Palestinian digital activism under the title #Palestine 2017. This annual report is published for the third consecutive year and monitors social media activities of all Palestinians throughout 2017. The research provides statistics and information about usage and internet accessibility of Palestinians, examines the most dominant social and political campaigns, viral hashtags and monitors human rights and digital rights violations of Palestinians for their digital activism. 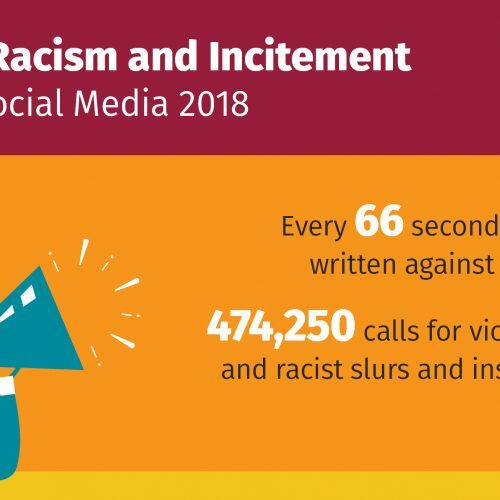 Additionally, the report focuses on the “digital occupation” of Palestinian social media through the use of algorithms, mass surveillance and tens of military and secret service affiliated facebook pages utilized to hinder Palestinian online activism and infringe on freedom of speech.The report bases its finding on (media) reports, press releases, interviews and secondary sources such as videos and photos for data collection. 7amleh Center publishes the #Palestine report annually to document trends in Palestinian digital activism and digital rights and violations thereof. The increased of importance of the digital space for Palestinians, especially due to the enforced Israeli geographic division, goes hand in hand with an increase in intimidations and limitations imposed by different governments on digital activism. The report concludes that Palestinian digital rights are targeted by all three authorities, including Israel, the Palestinian Authority and Hamas. As such, the report calls on authorities to comply with their responsibilities in relation to digital rights, as part of human rights, that should be upheld and respected where Palestinians are granted their rights to privacy and freedom of expression on the internet. 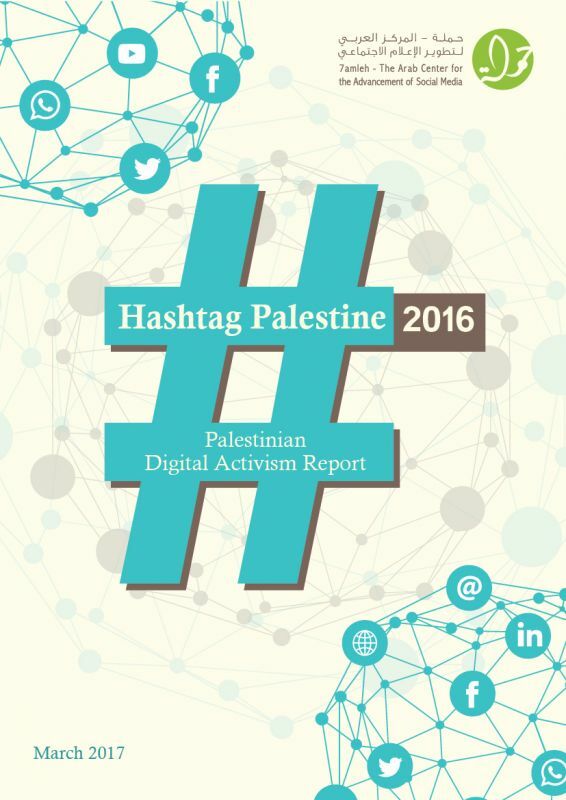 In the first chapter, the report provides data and statistics on Palestinian social media usage, including the challenges of collecting accurate data in particular regarding Palestinian citizens of Israel and Jerusalem, who are not included in Palestinian statistics since they receive services from Israeli operators. In 2017, there were 1,110,582 internet users of Palestinian citizens of Israel and 3,018,770 internet users in the West Bank and Gaza Strip. Wataniya, the second Palestinian telecommunications operator, was allowed to start operating in the Gaza Strip in 2017, after being denied to do since its establishment in 2006 by the Israeli authorities. In early 2018, 3G internet connection was finally allowed to be launched for West Bank Palestinians by Israel, but not for Palestinians in the Gaza Strip. The following chapter of the report portrays the most dominant social and political campaigns on Palestinian social media. The most popular social media campaigns in 2017 shed light on rights-violations in the Gaza Strip, Hyundai’s complicity in the Israeli occupation, the Palestinian cybercrime law and violence against women and the LGBTQ community in Palestine. Additionally, trending hashtags were launched surrounding the issue of Jerusalem, including the US decision to relocate the American embassy to Jerusalem and thus recognize Jerusalem as the capital of Israel. Furthermore, hashtags were created around the issue of electronic gates installed by Israeli forces around al-Aqsa mosque compound, as well as around the issue of Palestinian hunger striking prisoners, but also internal issues such as violations of freedom of expression and privacy by the Palestinian Authority and Hamas. The third chapter documents digital rights violations from the different governments: the Israeli government, the Palestinian Authority in the West Bank and the de-facto government of Hamas in the Gaza Strip. Furthermore, an analysis of different laws and legislations that reinforce the control and surveillance of, as well as limit digital activism and freedom of speech is undertaken. In the year 2017, Israeli forces arrested more than 300 Palestinians from the West Bank including East Jerusalem because of social media posts. West Bank Palestinians are indicted under martial law of incitement to violence, as opposed to civil law. At the same time, the chapter analyses arrests and interrogations of Palestinian activists by the Palestinian Authority and Hamas due to their social media activism. #Palestine 2017 furthermore focuses on the issue of ‘digital occupation’ and mass surveillance of Palestinian social media accounts and content, specifically on the social media platform facebook in its final chapter. This comes in light of the development of cyber-security units and predictive policing technologies where thousands of Palestinian social media accounts are scanned, analysed and then allocated a ‘quota’ on how likely they are to be a ‘suspect’ for a future ‘attack against Israeli targets’, as defined by the Israeli government. The Israeli cyber unit officially stated in a press release that Facebook accepted 85 percent of the Israeli government requests to delete content, accounts and pages of Palestinians in the year 2017. This kind of Israeli monitoring and control of Palestinian digital content on social media has become a tool for mass arrests and gross human rights and digital rights violations. This happens against the backdrop of social media and technological companies granting Israel the permission to implement such mass surveillance programs and increasing reliance on partnerships between the two. Israel’s systematic surveillance of the Palestinian cyber space also includes social media pages administered by what appears to be the Israeli security apparatus, that are publicly asking for cooperation and to share information in return for ‘personal help’.